When Priscilla Halburton-Smythe brings her London playwright fiancé home to Lochdubh, everyone in town is delighted…except for love-smitten Hamish Macbeth. Yet the affairs of his heart will have to wait. Vile, boorish Captain Bartlett, one of the guests at Priscilla’s engagement party, has just been found murdered - shot while on a grouse hunt. Now, with so many titled party guests as prime suspects, each with their own reason for snuffing out the despicable captain, Hamish must smooth ruffled feathers as he investigates the case…and catch a killer, before they fly the coop! M. C. Beaton is the author of the best-selling Agatha Raisin series. She has also written several Regency romance series. She lives between Paris and the Cotswolds. 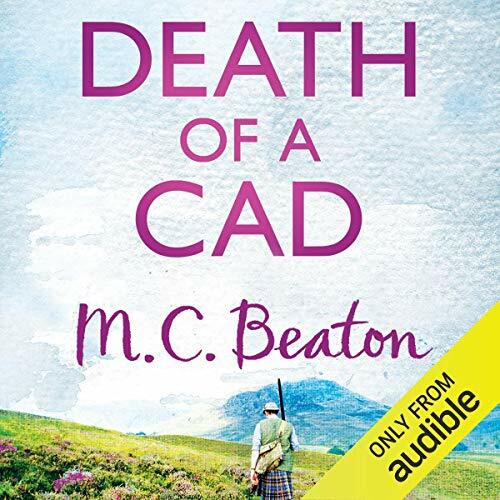 Death of a cad is a good yarn and M C Beaton has written an improved book on her first Hamish McBeth novel. Step back in time to a gentler time. Hamish is fun and a cool guy. Did David Monteath do a good job differentiating each of the characters? How? Yet again another thoroughly enjoyable read. A storyline with many twists and turns keeps the reader enthralled right to the end. A good, but not great, guilty pleasure. MC Beaton books are a guilty pleasure; with the characters as well as the author stuck with 19th-century values and prejudices, it can be painful to read about such passive, stifled and outright caddish females, but the bitter pill is sugar-coated with the amusing but dedicated and thoughtful lead character Hamish Macbeth and the occasional lyrical description of northern coastal Scotland. The whodunnit parts are well-done although wrapped up a bit too swiftly, but this is rectified in some of the author's later works. The narrator adds another 1/2 star with a beautiful voice and versatility with British dialects.